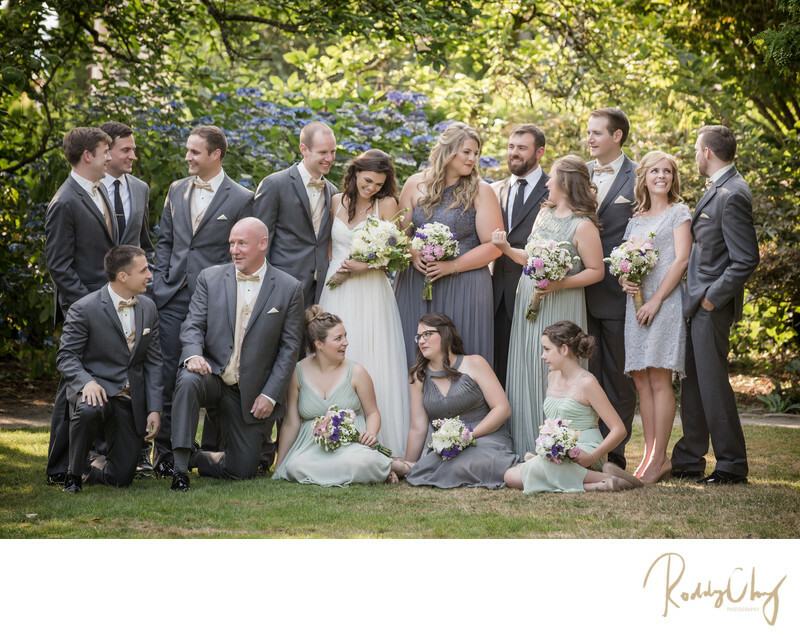 What an elegant photo of an energetic wedding party! This is Jana and Austin's wedding in the summer of Seattle. When we were coordinating where to go for wedding and bridal portraits, Jana actually suggested to go to Gas Works Park initially. However, knowing that it's a Saturday and there will be a lot of people, I recommended going somewhere else for the shoot. Later on they have decided to go to Marshall Park around Queen Anne. When I googled some images from Marshall Park, they look incredible. With all the water scene in the background from the view point, I thought it was going to epic. However, when we got there, there was nothing but direct and harsh sun light. I turned around immediately and saw a little park behind then told the whole wedding party to head there. It was a tiny park with no major attraction. However, Seeing the light allowed me to create something out of nothing. And that's one of the most important things when one looks for a wedding photographer- to think on our feet in unpredictable scenarios. Locations are not always the priority when we photograph people. The ability to see the light is what sets a photographer from others. Location: 1191 7th Ave W, Seattle, WA 98119. Keywords: bridal party (3), candid (15), wedding party (12).